100mm square newel cap. Recessed at the bottom to suit a 100mm x 100mm newel post for stairs. 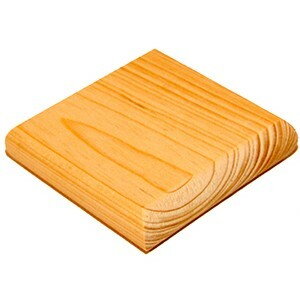 Flat newel caps are usually used to neatly finish square newel posts. They're designed to offer a sleek and simple design that will suit modern and traditional styles of stairs. These square newel caps are available in a choice of woods to suit your own personal taste, including Ash, Oak, Pine and Sapele. We also have white primed newel caps that are ready to be painted. All our wooden products are manufactured to exceedingly high standards in the UK and we offer them at competitive prices. Components you’ll find in our online shop include spindles, newel posts and caps, base and hand rails, volutes, and all other parts, including treads, infills, landings, and risers.